I am full of feeling these days. I've got raw nerve-endings, exposed right at the surface of my skin. I am prone to cry. But don't you feel one teensy, tiny bit of pity for me. I wear it well! If anyone can pull off the puffy-eyed look, it's me. Because along with this sensitivity is coming great creativity and bravery and passion and purpose. As my kids will tell you, "It's a happy cry." I am pushed forward by a wave of coming-together. It was an epiphany when philosophy merged with education. And now, creating a school, I am watching my teacher-self merge with my parent-self. It's making sense. It's a win-win. I am being true to my whole self. This project is myself, even if puffy-eyed. Frightened as hell, but not afraid to say it, I am learner and teacher, creating and being created. It is amazing how liberating it is to a) figure out what's been bothering you, b) be with people you love, and c) do something creative. October through June... and beyond! It's been a while since I posted, but with good reason. The school year hit me like a ton of books. I worked more than ever since we've been parents (12 hrs/week), and I was a part time student working on an MA in Education at the same time. Juggling those with motherhood and marriage and moving left little room for recording my musings. But summer is approaching and peeking into the thought of a free afternoon here or there has me giddy. I've only one class left to finish my degree (done by end of August/early September), so this summer I'll be balancing that with my time home with the kids and just a few projects for work. A lighter load. More thoughtful me time. And I really enjoy the luxury of time because I do better thinking when I'm not multitasking so much. Once my MA is done-- did I mention, just a few more weeks?-- I'll free up some cognitive real estate and, if the better angels win out, fill it with thinking/writing about what I want to think/write about. It's not that I haven't enjoyed the program. I actually really have. The content has caused me to grow, and I've felt like a lot of things sort of came together in reading through the thinkers we've studied. Many untethered thoughts and rootless intuitions became better connected and deeper understood, which translates to better able-to-be-used. I like to think that I do have good intuitions about teaching. And those haven't changed tremendously, but my confidence has, and my actions are now based more on reasons and principles and less on the hard-to-explain-to-others/hard-to-replicate gut feelings. The learning has deepened my efficacy for teaching because I no longer think, "I am a good teacher because it seems like my students learn. Boy, I hope I get lucky and they always learn in my classroom." I now think, "I am a good teacher because I know how to make content personal for students, I allow students to grapple through ambiguity until they reach their insight, I validate my students' individual growth and keep them each moving forward in their own learning, I reflect and modify what doesn't work in the classroom to continually improve my students' experience...and for all of these reasons, my students learn. I know I am responsible for their learning, and I proud to see my fingerprints all over their growth. Best of all, I know I can do this with my future students as well." That is a summary of the shift, but the oversimplification still gets at the heart of what the learning has meant for me. Oddly enough, the longer I teach, the more idealistic I get. That's not the anticipated trajectory. Think of the veteran teachers in the staff lounge during lunch-- they exist on every campus-- eating their sandwiches and crowing about policies and personalities, running Scantrons through the computer while moaning about the ever-changing tide of educational whim. That's where the fresh faces end up after 15 years. But you know what, I'm half way through those years in the profession and I don't see myself as half way there. I'm more like a "naive" teenager when it comes to what I think is possible in my profession. I love teaching, and I love it more all the time. Part of that has to be where I am teaching. At Visalia Charter Independent Study, we serve mostly "at-risk" students-- meaning, they are at risk of dropping out, not receiving a high school education for myriad reasons. But the one on one and small group atmosphere has connected these kids in a way that brings them back into the educational fold, so to speak, and my successes there-- my students' successes-- are so inspiring to me. It is such a powerful feeling to be a student's mentor/friend/teacher/cheerleader and to see that relationship be the difference in the student's success. Last night, I saw three of my students graduate from our school and Friday, I'll go watch another of my students graduate from a traditional high school (he transferred back for his last semester). These students have all gone through some traumas that set them back a pace. I am so grateful to be part of an educational program where those traumas don't have to define their academic chances. The flexible pacing of our school's program, the individualized nature of it, makes it possible for challenged students to be successful. It feels just. I dedicate my rose to my teacher for never giving up on me and believing that I could graduate. Thank you for everything! This kid has no idea what joy her story brought to my life. To think that my encouragement helped such a worthwhile, thoughtful, beautiful person rise up and validate herself through her own accomplishment...to think she learned something from me and grew to better confidence and better choices because she had me as her teacher...this is why I teach! ... is this too ambitious? I made another batch of balm, and this time, I took a few photos along the way. Jackie continues to benefit from it-- it keeps his skin smooth and reduces the itch when his eczema flares a bit. (That continues to improve-- he's better all the time...). I was happy that I was able to brew up some extra stock to share with friends and family this go around, too. I'm sure Jack's not the only one who gets dry itchiness! 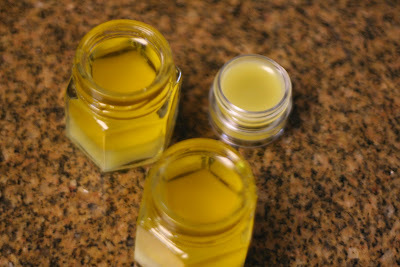 Just poured the balm into the jars-- still liquid. Balm begins to solidify as it cools. In the last month or so, our family has made some adjustments in our thinking and eating to help our son Jack with his eczema. I am learning so much right now and I'm getting so excited about how Jack is improving. I wanted to write this post to catch up our family and friends, but also to get some of these things written down so that others who struggle similarly may benefit. Jack's eczema started when he was around 3 months old, shortly after his first round of antibiotics, which he'd taken for a double ear infection. I felt horrible about having to give him antibiotics at such a young age, but his screams in pain conjured a particularly painful Christmas Eve from my childhood, and I couldn't stand it. Also remembering that his Daddy has ruptured ear drums twice in his life, I acted in what I thought was his best interest, and he got the antibiotic. Although I don't regret that choice (especially given his family history), I do wish that that episode had never happened. It was the beginning of multiple illnesses (pneumonia, more ear infections)and more antibiotics. I actually lost count, but I think it's somewhere between 4-6 rounds, during which time we discovered he is allergic to amoxicillin (hives were no fun). In the same time line, Jack's eczema went from an annoyance to a real concern. He went from a couple spots on his wrists to behind and on top of the knees, inside and around the elbows, all around his ankles, and spreading across his knuckles as well. It varied in intensity on a day-to-day level, but over weeks and months, he was definitely getting worse. Some days I couldn't keep him from scratching and other days, he seemed unbothered by the red, irritated patches. Until a month ago, we'd only really tried traditional treatments. When he was a little baby, he'd rub his wrists (the first place it showed up) over and over on my chest as he slept next to me through the night. I mentioned it to our pediatrician, and he diagnosed eczema and prescribed a mild steroid cream. I applied it thinly only when Jack was uncomfortable because I felt uncomfortable using it intuitively, but when desperate it provided some relief. As his eczema worsened, I began applying more often (up to twice daily), but this only provided momentary relief and never long-term progress. In fact, looking back now, I believe I may have exacerbated the problem by using these Rx's. Jack's skin would briefly improve (but never heal, it always felt, at best, leathery in these spots) and it would also lighten the color (hypopigmentation is listed as a possible side effect of the corticosteroid creams). I have also been worried about Jack's being at the 5 percentile for weight since he was about a year old. I am thin, and was as a baby/child, so this could account for all of that, but when I read this information about the cream I was using for Jack, it struck a chord with me as well. Pediatric patients may demonstrate greater susceptibility to topical corticosteroid-induced HPA axis suppression and Cushing's syndrome [non cancerous tumor on the pituitary gland] than mature patients because of a larger skin surface area to body weight ratio. Though we were using a mild corticosteroid, and certainly not "chronically", these side effects troubled me. But more troubling was the simple fact that Jack was not improving. We talked with his pediatrician who was very nonchalant about it all, suggesting he'll just outgrow this and that it tends to run in families. He also prescribed a stronger steroid cream for Jack. Still, the waxing and waning suggested something more than just a proclivity for dryness. I felt his body was responding to something, I just couldn't narrow down the trigger any more than soy products (due to his itchy after eating edamame and ranch dressing) and I knew that couldn't account for all of it. So, a couple months ago, I became determined to try something new and focus my efforts to find a fix. Jack was only getting worse, my heart was aching for him to find relief, and the medicines I was getting from his pediatrician didn't seem right, both intuitively and empirically. Some trite quote says that "the definition of insanity is doing the same thing over and over and expecting a different result". Though simplistic in its parameters of insanity, a point I'll let rest for the purposes of this post, the concept applied here-- we couldn't expect Jack to improve with this course of treatment. Traditional medicine was not bringing Jack wellness. So I sought out my acupuncturist's help. Prior to this turning point, I had had a mental block about enlisting her treatment because Jack is too young for needles (actual acupuncture treatment). But all of a sudden it occurred to me that she can do much more than just needles (herbs, acupressure, etc.). I googled "eczema acupuncture" and read this good article, which really helped me understand the nature of eczema from the Chinese medicine standpoint. I called Paula, and that simple move prompted a shift toward wellness. Here's what we are now doing for little Jack. It began with NAET treatment. This treatment is not available everywhere, and is relatively new on the allergy/ alternative medicine scene. It's an interesting "voodoo", that involves muscle testing in the presence of an allergen to check for sensitivities to the allergen, then acupressure in presence of allergen to teach your body how to redirect the energetic flow and function correctly when it is near. You can learn a lot more about NAET here to better understand the thinking behind this technique. When I first came into her office to work on Jack's health, Paula suggested this course, and I thought this would be the best approach since I felt he had lots of food sensitivities (soy, maybe dairy, maybe eggs, maybe tomatoes...). I was becoming a bit of a paranoid person over it-- feeding him, watching for itchiness, not really sure if it was related, trying again, avoiding, hypothesizing... My husband and I ultimately decided to go ahead with NAET for the simple reason that it had no downside, no side effects, no "cons" to weigh other than the price of the treatment (but even that, my insurance will cover), and if it worked-- the treatment intends to rid a person of their food sensitivities and allergies-- it would have a pretty nice upside. During the first couple of NAET treatments for Jack, Paula advised me about the importance of the gut/intestines/digestion to your overall health. She explained to me that because of Jack's multiple rounds of antibiotics, his digestive tract was likely out of balance. When the good flora is killed along with the infecting bacteria, this leaves lots of space and no competition with the natural yeast that lives there as well. Without the inhibiting bacteria that is present in a healthy person, the yeast can overgrow and dominate the gut and this has many unpleasant consequences. First among them is that the person is not able to break his/her food down into the smaller enzymes necessary to make energy or nourish the body (since the healthy flora is part of that break down process). The body can show a host of negative symptoms as a result of the lack of proper digestion and nutrition (even from a well-balanced, otherwise healthy diet). Eczema is one of them. Paula diagnosed Jack to have this over-growth of yeast (candida) in his system, which was likely caused by the antibiotics he has taken. Operating on that supposition, she suggested we adjust his diet to exclude sugar (since sugar feeds yeast), yeasted products like bread (no need to put more yeast in there), and also diary products (often high in sugar and the protein is inaccessible to a compromised system because it is particularly large and can't be broken down without enough good bacteria to do the job). If we followed this diet, the yeast would have less food and begin to die off/not multiply as quickly. She also suggested that we add probiotics to encourage bacteria growth and provide some competition for the yeast. Here's more about diagnosing and treating candida/yeast overgrowth. And here's a good, short article from a holistic medicine magazine about the connection between eczema and candida, as well as many ideas for easy, holistic treatment. This sounded simple enough, but when we decided to take on this dietary change, our family went through a week of grief. Actually, it was my husband and I who grieved. Being self-proclaimed "foodies", especially being a big baking household, the thought of no milk/cheese and no more home-baked bread was super sad. After a day or so of this teary processing, we realized that we'd just have to focus our foodie creativity in a different direction for a while-- that this new diet wasn't a life sentence for Jack; it was a trial and error thing that, at most, might last a few months to a year if it proved helpful. And if it proved helpful-- we'd have a happier, healthier boy-- totally worth it. We cleaned out our pantry and made a few trips to our local health food store, Trader Joe's, and Whole Foods. I became a big time label reader and learned a lot this way-- amazing how many things have sugar in them-- beans? c'mon, why?! We made conscious decisions about what to prepare ahead for snacks, because I knew in a time crunch when kids are hungry-cranky, that'd be the time I'd be most tempted to give them something off-diet. We decided to keep fruits and vegetables totally on the table (we have a good organic CSA membership and we know it is all "clean"), but we try whenever possible to choose the lower glycemic fruits (like apples, pears, berries) rather than the higher glycemic fruits (like stone fruit). We switched the morning organic whole milk to rice milk, also organic and enriched to provide almost the same amount of nutrition. We eat lots more rice, as the preferred carbohydrate without bread around (mostly organic, brown rice). We've learned to use Agave nectar in place of maple syrup so we still get to have pancakes, a family favorite. We sweeten Jack's oatmeal with agave as well, and grind in some flax seeds for the omegas, which help his elimination (good-- get the dead yeasties out of there) as well as his skin. Adding the probiotic was easy peasy too. Here's the one Paula ordered for Jackie. We mix a quarter teaspoon into about 8 bites of applesauce for him, and its is a yummy treat. We also purchased some chewable probiotics which are less potent, but you can't really overload on them and since we don't really pass out jelly bellies anymore, the chewable vitamins have become a kind of treat in the kids' minds. Speaking of vitamins, they are taking Vit. C a couple times during the day (I learned that Vit. C is a natural histamine blocker, helps with itch, as well as immune supporter in general), a mutiple vitamin, calcium, and omegas. We are about a month and a half into it, and here's what we're noticing. On day 6, Jack's eczema flared up to twice its regular size and was, needless to say, itchy. We were feeling discouraged about it, but decided we'd stick with the diet and probiotics until our appointment two days later with Paula. By our appointment, the eczema was looking much better. Paula explained that the flare up was to be expected. Apparently, when yeast dies off, symptoms can flare up. The first, most noticeable improvement was Jack's appetite. It was always tough to get him to eat before this dietary shift. Jack used to ask for sweet treats all the time. But once our minds were commited to this, saying "No" became easy and he could tell we meant it, so he stopped asking. He learned to ask for what we say yes to, and he seems to be developing a taste for healthier foods. His appetite is much greater now, too. He eats probably double the volume he used to. This is a really pleasing change for me as his mom. Having everyone tell you your son is "tiny" gets old pretty quickly. Each time I heard that, I felt a pang of worry about whether something might be wrong with him. Now that he is a good eater, if Jack stays relatively small, I have the ease of knowing that it is just his body type, not some side effect or deficiency. The other really quick change was his overall attitude and behavior. Jack's always been a good boy, but he just seems a bit brighter and happier since his body is feeling better. This is also especially pleasing for a mom. And last, but not least, I am learning to trust my intuition more. Aside from the internal "work" we are doing with the diet adjustments, we've also altered our topical treatment of his eczema. Our pediatrician had suggested we use Eucerin after baths, but when I tried that with Jack, it burned his irritated spots. He seriously acted like he was on fire. I supposed that the alcohol in it must've caused the open spots to burn, so I was desperately searching for something super moisturizing that wouldn't burn when he had scratched himself. I, of course, preferred soaps and lotions for him that were all natural, but many of the products marketed this way were disappointing. They contained soy, which we've suspected as a trigger for him, and they also contained many other preservatives or extras that we just didn't need. I read this article from Acupuncture Today when I began thinking about changing the products we use. It explained why you want to keep moisture in but also allow skin to breathe (in other words, why petroleum products are no good), and also suggested certain herbs and oils as beneficial. Upon further research, I found these same herbs and oils repeated over and over again all over the Internet (calendula, lavender essential, jojoba oil, coconut oil, almond oil...). 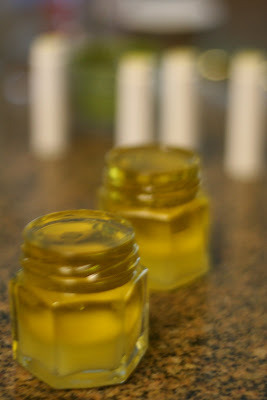 I began collecting necessary ingredients and I made a couple different oil mixtures and a palm oil based cream, but we've seen the best results with the following recipe (amounts are approximated). 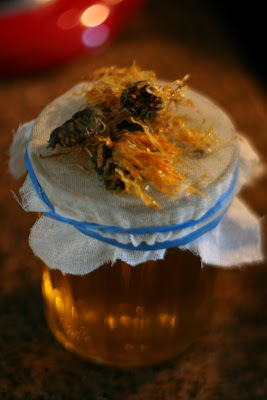 I began by infusing dry calendula flowers (purchased from my acupuncturist, Paula, but also available online at the link above, which also explains their beneficial properties) in extra virgin olive oil. To do this, I grabbed a hand full, placed them in a jar, saturated with olive oil (about 2/3 full of flowers) and left in a dark cabinet for 3 weeks. Every time I opened that door in the pantry, I shook up the jar a bit to keep things moving. On mixing day, I poured the entire contents into a pot and heated very low for a few minutes, then strained through cheesecloth, squeezing the flowers and then wringing the cheesecloth to get all of the good drops of calendula-infused olive oil I could possibly get. Next, I melted some beeswax in the calendula-infused olive oil, again on low heat, and poured in about three tablespoons of coconut oil, a couple drops of tea tree oil (anti-fungal, anti-septic), a splash or two of some sweet almond oil, a splash of Vitamin E oil, a splash or two of jojoba oil, and a bit of evening primrose oil. Once melted together, I poured it into my empty vessels and allowed to cool. It solidifies when cool because of the beeswax. Though this recipe is approximate, the ratio is really all you need to make your own salve. If your stuff is too dry/thick when you're done, just scrape out of your vessels, and warm over a low flame until liquid and add more oil this time. You want your salve to end up solid so you can scrape some out with a finger nail when you're using it, but you want it to melt into your skin when rubbed a bit. It feels great!!! Jack loves it and I've noticed that if I rub an irritated spot with a baby wipe and he complains of it hurting, the salve takes the pain/burn away, so it is very mild and soothing. Even in a flare up, this stuff feels good. We've also been doing ground oatmeal baths (just food process bulk oats to a fine powder, and use about a cup per luke warm bath) for quite a while now. I brewed some licorice root tea for his bath, but abandoned it because I didn't think it was effective for relieving itch. I'm continuing to research and learn more. I found this neat forum of moms who have a similar story, and it is good to read what others think and do for their kids. We have an appointment Friday morning to talk to a local homeopathic doctor and I am excited to hear his thoughts and suggestions. I also purchased some zinc in liquid form from my health food store today, since that is also recommended for eczema sufferers. I'm planning to look into digestive enzymes... there's a lot of information out there and we're checking into it. The natural route might not be the quick fix of the corticosteriod cream, but it is definitely turning out to be worth it in the long term. I am so grateful to have the resources around me to find a way to help my little Jackie boy. We had another argument. I have an extraordinary daughter in many ways, but she is also a "3 3/4 year old" who is quite capable of being impatient, demanding, rude, defiant, and all of those other nasty traits we hope, as parents, to tame. The problem is that when she gets rude and defiant, I get incensed and angry! After Harper hoisted some ugly shouts my way this morning, I shouted back at her with equal ire. I feel so tight in my chest and headachey ever since because I feel guilty about it, worried about it, sad about it, and disappointed in my lack of self-control about it. After a few minutes of cooling down, we talked it over and I tried to explain that shouting, turns out, was something she and I both needed to work on. Neither one of us enjoys it, both of us feel totally horrible when shouted at. The hard part is that I never feel like I really have her full attention when I'm trying to explain something complicated like the dynamic of her impatience, which caused her anger, which caused her shouting, which caused my anger, which caused my fear/concern that my kid was going to be "this way"/rotten, which caused me to feel angry and out of control in general, which caused my shouting back at her, which caused her fear/concern that Mama had lost it, which caused her anger to escalate, which caused the subsequent horrible feeling of sadness for both of us. It's a bit much for her to follow, especially as Jack is moving in for a hug and kiss and asking her to focus on a serious talk that long seems more like a punishment to her than a reconciliation, and she really is only 3 3/4 years old. So I boiled the explanation down to just this-- that we both need to not-shout, and instead voice our feelings of frustration and anger along with why we are feeling that way. Prevention. Still, the remaining day is not good. I find myself surfing the internet looking for a scolding, an article telling me how bad a parent I am for succumbing to my anger. I typed in "shouting kids" in the search bar and found this article instead. I thought it was pretty honest, and it ended up making me feel a teensy tidbit better about today's bad few minutes. You know what? I'm an imperfect parent with an imperfect kid, but we are both committed to improvement. I thought I was impervious to those "research shows . . ." scare stories, but this one got to me. Shouting at children, according to a recent study by psychiatrists at a hospital affiliated to Harvard Medical School, can significantly and permanently alter the structure of their brains. It was only inordinate self-restraint - of the kind I never display towards my kids - that stopped me marching them straight off for a brain scan. Ours is a Sturm und Drang household, with shouting matches, screaming fits, and temper tantrums - and that's just the parents. The neighbours have been warned, even the kids have been warned. At two, my first-born could do a passable imitation of me yelling (and she did, to all-comers). And one of her sibling's early sentences was: "You're a lovely Mummy, but a shouty one." The Harvard study comes in the wake of the revelation that Jennifer Aniston, the Friends star, is not on speaking terms with her mother, partly because she shouted at the actor when she was a child. "Yes, I shouted," admitted Mom, "but a lot of my friends yell at their kids." Please God my girls never make it to Hollywood. Is shouting at one's children the ultimate parental taboo? Certainly, it contravenes all the good parenting slogans. Shouting at children shows them that you're out of control - and I am. The reassuring thing is that almost everyone seems to do it: rarely before in my writing life have I found such an eager queue of volunteer interviewees. And almost everyone admits that it doesn't work. There's an American saying that shouting at your children to obey is like using the horn to steer your car - and it produces the same results. But this misses the point: you don't yell at your kids because, after careful consideration, you deem it the most effective strategy; you yell at them because you've lost your rag. The triggers are many and various, but maternal isolation and exhaustion come high on the list. Cathy Brewer, mother of two-and-a-half-year-old Gemma and five-year-old Jack, confesses: "When Jack was little, I was on my own with him a lot and shouted at him a lot. With Gemma, I've had more help and so I shout less." Pippa Fox shouts when her children want her attention and she's trying to make their tea. Alice Goldman finds she shouts most "at the end of a day you feel should have ended but hasn't". "I shout when I'm tired," she explains, "but also when my expectations are highest - on holiday or the weekend. And I often shout at my daughter when I'm angry with myself." As for me, like most mothers, I rant when I've an unconscionable number of things to squeeze into an unfeasibly small amount of time (which happens most days). I also thunder when my kids encroach on the last vestiges of my personal time and space: I have this peculiar belief that, after more than 11 years of parenting, I should be allowed to pee in peace. Almost all shouters feel guilty. Pippa Fox says she's so ashamed she shouts at her sons, aged five and nearly two, every day that "I'm trying to cut down" - as if it were like smoking. When Alice Goldman first shouted at her two-year-old, she was so horrified that she went straight round to the health visitor to confess. "The health visitor just laughed and said: 'You'd better get used to it.'" Is it so inevitable? 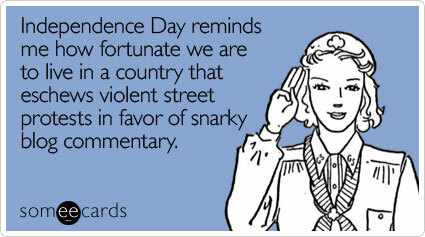 I've concluded that there are shouty families, and non-shouty ones. DW Winnicott, the psychoanalyst, argued that all mothers feel dominated, exploited, humiliated, drained and criticised by their babies, and that "the mother hates her infant from the word go." Fay Weldon once said: "The greatest advantage of not having children must be that you can go on believing that you are a nice person: once you have children, you realise how wars start." Sebastian Kraemer, consultant child and adult psychiatrist at the Tavistock Clinic, London, takes a robust view: "I can't imagine how parents can't shout at their children. Family life is such a cauldron of emotions. A happy family has to have some conflict in it: in intimate relationships people have to row and make up. A 15-year-old makes you shout at him sooner or later." Shouting at kids is often bracketed with smacking them, but for many of us it's an alternative. But when does shouting turn into bullying or verbal abuse? It's partly a matter of degree and ratio. According to Kraemer, "If there's no remission in shouting and there's no loving as well, it's destructive." The age of the child and what you actually say is also important. "A toddler doesn't understand the difference between you shouting at them and hating them," he elaborates. "With a teenager, that's not the case. There is also a difference between honest self-disclosure ('You've made me very angry') and abuse ('You're a horrible little brat')." Though many of us worry that shouting at our children will damage not just their brains but their wellbeing, most children quickly become desensitised to loud parents and tune out. "I think I suffer more from my shouting than they do," Pippa Fox says. "I feel absolutely awful afterwards, whereas they're fine five minutes later." According to Jenny Riley, whose sons are 12 and 14, "The more you shout, the less they listen, and so the louder you have to shout as the years go by - depressing, isn't it ?" Another result of shouting at children is that they become pretty adept shouters themselves. On the other hand, children who've never been yelled at can be quite fragile flowers (or so I like to think). And almost all shouters agree that a good yell can clear the air and be liberating. Jenny Riley is that rare thing, an unrepentant shouter - not only that, but a qualified counsellor. "I grew up in a don't-express-yourself household," she says, "but I'm a volatile person, and I've got volatile children, and on balance I don't think that our shouting hurts any of us. If I overdo it I say sorry. "I've studied all the skills. I'm just not good at practising them in the four walls of my own home." One way of shouting less, according to Doro Marden of Parentline Plus, the parenting support organisation, is to record your evening meal on cassette and hear it back afterwards: "It can be quite instructive." Marden also suggests that thinking about the trigger situations can help. "Is it when your blood sugar level is low, or theirs is? Is it always when you pick them up from school? You can also try not to get caught up in their anger." Most crucially, as psychotherapist Roziska Parker puts it in her book Torn in Two: The Experience of Maternal Ambivalence (Virago), mothers vary in the extent to which they can tolerate and manage the conflict provoked by loving and hating the same child. So the guilt and anxiety we feel about shouting at our kids comes partly from our discomfort with the realities of parenting, and disappointment at failing to become the idealised parents we hoped we'd be. No one would advocate shouting as desirable parental behaviour, but perhaps a more realistic aim is not so much to try to staunch it as to acknowledge it. No easy feat: every parent I interviewed for this article asked for their name to be changed. 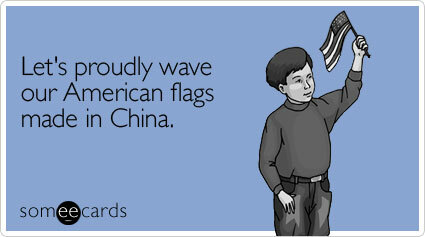 (I obliged.) Shouters, it seems, still put themselves on a par with convicted criminals.